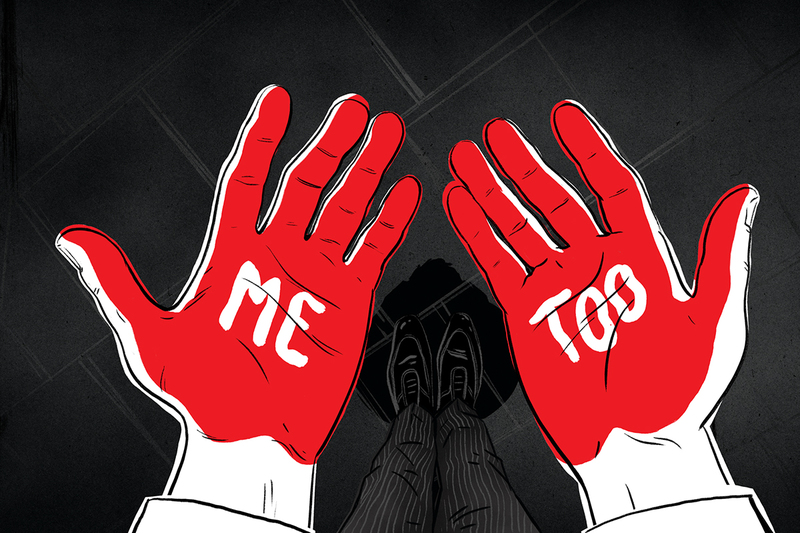 Home Politics Did Governor Bill Walker End His Campaign Over #MeToo? It seems Mallott helped some gal get a lucrative position [in the state government] and used the phrase "You owe me". I hear there was a little more to it, but that was what caused her to run to Walker and complain. There we have it, Bill Walker's best friend and Lite Governor tried to get sexual favors by using his political power. The question I have is, how many times has Byron Mallott done this and has he been successful in the past? My understanding is that these types of "you owe me" sexual innuendo don't just happen once off-handedly, these innuendos typically have a long history in the person who does them. The next most logical question then is, IF Byron Mallott has done these types of things in the past successfully did Bill Walker know about it? My sneaky suspicion is that in fact Bill, DID KNOW and he didn't say anything until his hand was forced by this lady. My other sneaky suspicion is that the lady in question threatened to go to the press with all the details and Walker didn't want the media attention over the fact that he allowed his administration to curry sexual favors and so he simply resigned his campaign. I ran for re-election because I still believe that, more than anything else, Alaska deserves integrity, honesty, and courage. Alaska First is, and cannot only be, a campaign slogan. When I said I ran for governor to do the job, not make the decisions to keep the job, I meant exactly what I said. Every decision I have made as your governor, I have made on the basis of what I believe is best for Alaska. With that said, effective today, I am suspending my campaign for re-election as Governor. With more time, I am confident that Val and I could deliver a message and a campaign that could earn a victory in this election. But there are only 18 days remaining before election day. Absentee ballots have already been mailed, and Alaskans are already voting. In the time remaining, I believe we cannot win a three-way race. 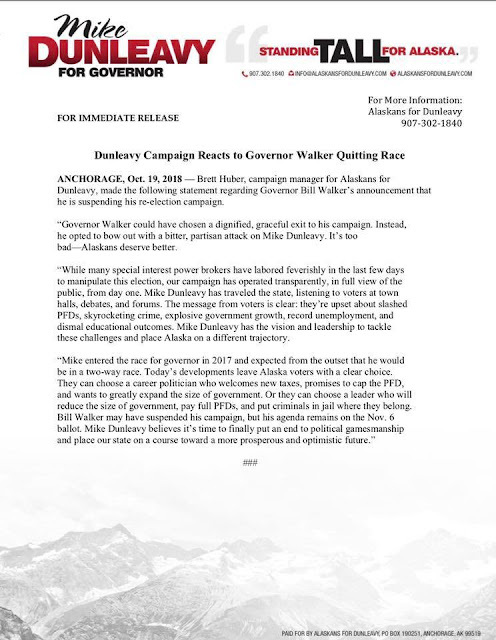 This week I have talked to many Alaskans to determine whether I or Mark Begich had a better chance of running a competitive race against Mike Dunleavy. The determination was made that, at this point, Begich has the better odds. cause our most vulnerable to suffer the brunt of the additional $1 billion in budget cuts he vows to make to education, rural Alaska and those receiving healthcare. Moreover, my administration has worked tirelessly to improve the relationship between Tribes and State and restore respect for Alaska's First Peoples in state government. Yesterday, I apologized on behalf of the State of Alaska for the wrongs committed against the Alaska Native people throughout our history, because I believed that was best for Alaska. My expectation is that this work critical to the healing of historical trauma and unifying all Alaskans will be undone in a Dunleavy administration. On balance, it is my belief that despite my many differences with Mark Begich, his stance on the important issues I have listed above more closely align with my priorities for Alaska. This is not the first difficult decision I have made this week, but it is one I know I must make. There simply are no words to express my deepest gratitude to the incomparable, dedicated team of outstanding Alaskans who have served in my administration and to the thousands of supporters, donors, volunteers and campaign staff who have been passionately committed to my re-election. And above all, I want to say thank you to my family and to Donna, my first lady for life. As I said earlier this week, ultimately, it's not how long my team and I serve, it's how well we served the people and the state we love while the opportunity was ours. We have served with integrity, courage, devotion, and compassion, never asking ourselves whether a decision is politically correct but always asking if it is right for Alaska. I am proud of the work we have done in the most challenging fiscal crisis in state history and it is the honor of my life to have served as the governor of this great state. Thank you, God bless you all, and may God continue to bless Alaska. For those that have been paying attention to the polling, Begich DOES NOT have the better chance of winning against Dunleavy. All the polls have Begich losing to Dunleavy and Walker. And because early voting has already started it doesn't make sense for Walker to have stepped down, making all the votes that were made for him null and void. The only logical answer for Walker suspending his campaign is because he has been #metoo'd.